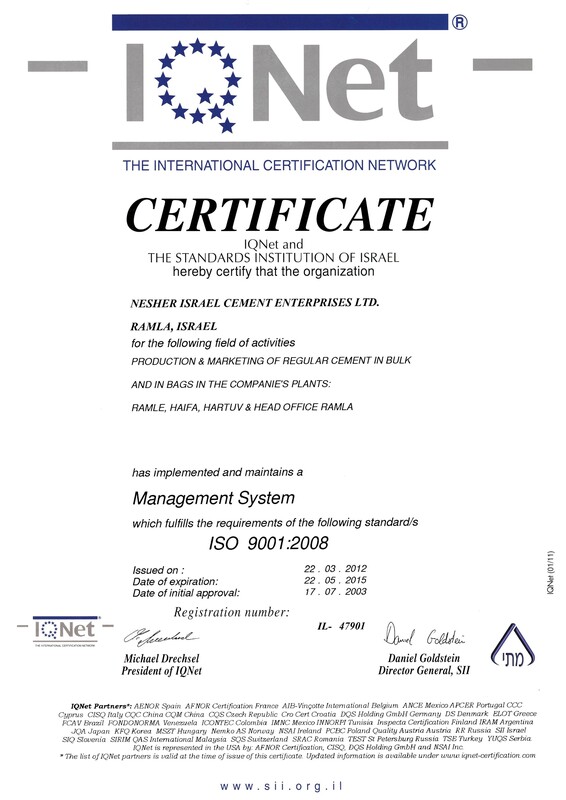 Nesher is the only cement producer certified to mark its products (cement in bags and in bulk) with the Israeli "Standard Mark"
As the leader of the cement industry in Israel, Nesher is committed to delivering an excellent quality product, measured, among other ways, by the level of its customers’ satisfaction: The manufacturers of ready-mix, prefabricated and prestressed concrete. The direct communication that the company maintains with its customers includes ongoing technical support on all matters concerning manufacture of concrete, complete transparency in the cement manufacturing process and open communication of information to the customers. Nesher works to ensure stability and high quality of the cement it manufactures and to adapt it to its customers’ changing needs. The company’s quality policy and the stringent criteria it implements apply to all company employees. The cement we deliver to our customers is sampled every workday to ensure compliance with the Israeli standard (IS 1) and Nesher’s criteria. The computerized control system, used in all production processes at the Nesher plants, is equipped with state-of-the-art technologies and backed up by ongoing laboratory tests. This advanced system enables real-time monitoring of the processes during production and sends immediate alerts to the supervisors and production managers. The Nesher plants are certified to quality management standard ISO9000, and the various laboratories at the plants are audited by the Israel Standards Institution and participate in international comparative programs (CRIC, ATILH). The production and the quality assurance processes have been certified for the European CE standard. As a basic component of buildings and infrastructures across the country, cement production at Nesher is required to undergo meticulous and professional processes. Nesher is committed to manufacturing and marketing a high quality, safe product bearing the Israeli standards mark. Nesher is the only cement manufacturer authorized to mark its products (cement in bags and in bulk) with the Israeli “Standard Mark”. The cement manufacturing process and the exacting quality control are carried out under the strictest Israeli and worldwide standards and are subject to supervision by the Israel Standards Institution. The European EN standard for cement describes types of cement according to their composition and strength and classifies them according to their additives and clinker content. In line with the EN standard, Nesher tests the cement types it manufactures according to the European classification system.